Il primo Sistema Radar ad Alta Frequenza in Africa è operativo. Chiamato SeaSonde, il sistema ha due stazioni, a Casablanca e Temara; complessivamente, nel mondo, sono attivi 600 radar ad alta frequenza, di cui 60 in Europa. Il sistema, messo a punto dalla Direction de la Météorologie Nationale del Marocco, fornirà informazioni continue e accurate sul tempo e il clima marino; in particolare, produrrà una mappa oraria delle correnti con una copertura maggiore di 10.000km2. The first High Frequency radar system in Africa is operational. Named SeaSonde, the system has two stations, one in Casablanca and one in Temara. There are 600 high frequency radars in the world – 150 in the US, 60 in Europe – and these are the first two in Africa. 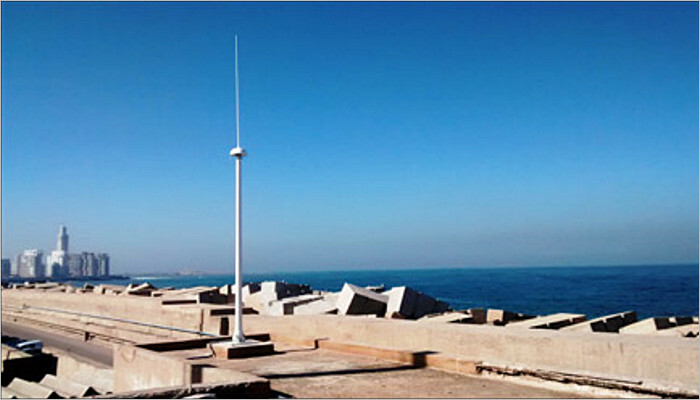 The Direction de la Météorologie Nationale, a public service part of the Ministry of Energy, Mines, Water and Environment of the Kingdom of Morocco set up the system to providing accurate and continuous marine weather and climate information. SeaSonde produces an hourly currents vector map with coverage larger than 10,000 km2; as well as half hourly significant wave height time series in each radar station with a range of up to 200km from the coast.